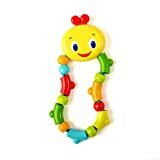 A terrific teether from Bright Starts. Its colorful beads feature different shapes and textures that soothe your child’s gums. Twist, turn and teethe with Bright Starts.